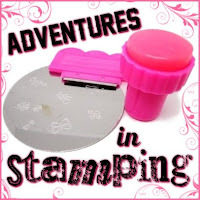 Today's stamping is all about the lilac base, which is fabulous for me because it gave me a chance to use my new a-england polishes! I have to say, I am so glad that I finally bought these polishes! They are amazing! I started with 2 coats of Guinevere. Guinevere is a yummy, dusty lilac that is just so creamy! My 2013 Cheeky Jumbo plates arrived this week and I was so excited to use them! There are so many amazing designs on these plates! I added my design using JP9 Wild at Heart, a-england Elaine and Essie No Place Like Chrome. My little Babars are so cute! I am going to have so much fun with these plates! You can purchase these plates through Amazon, however I did just learn that they are out of stock. Of course it's Babar! Lol, took me a minute. I ordered the new Cheeky jumbo plates last week - I'm so excited waiting for them!